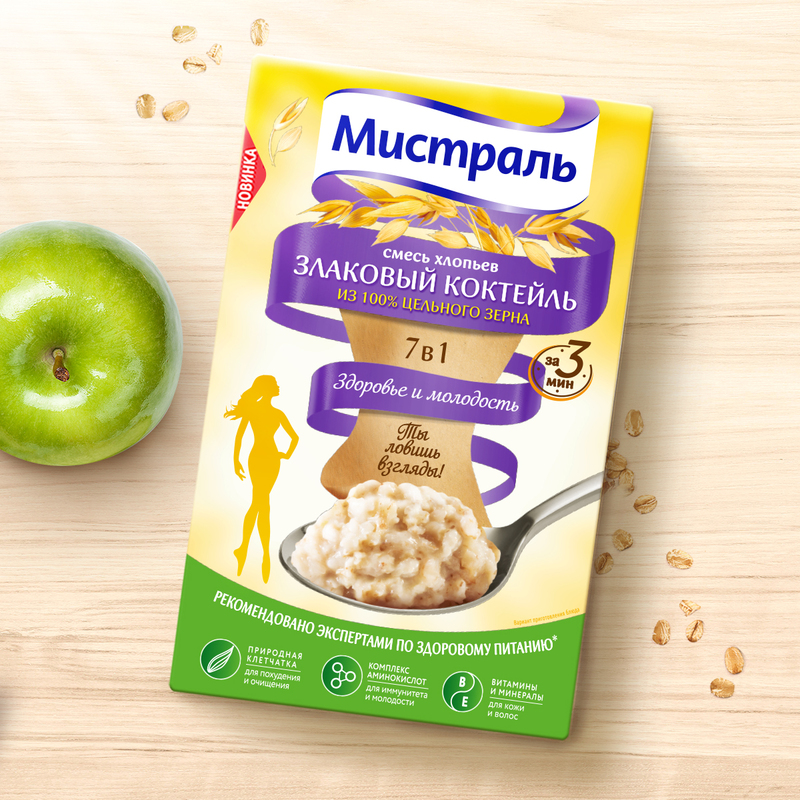 The "Mistral Trading" company commissioned us to create the packaging of light breakfasts for people who adhere to a healthy lifestyle. The Mistral Trading company already has a line of basic porridges without flavors, for those who just like oatmeal; there is a line with dessert flavors, for those who like to pamper themselves. 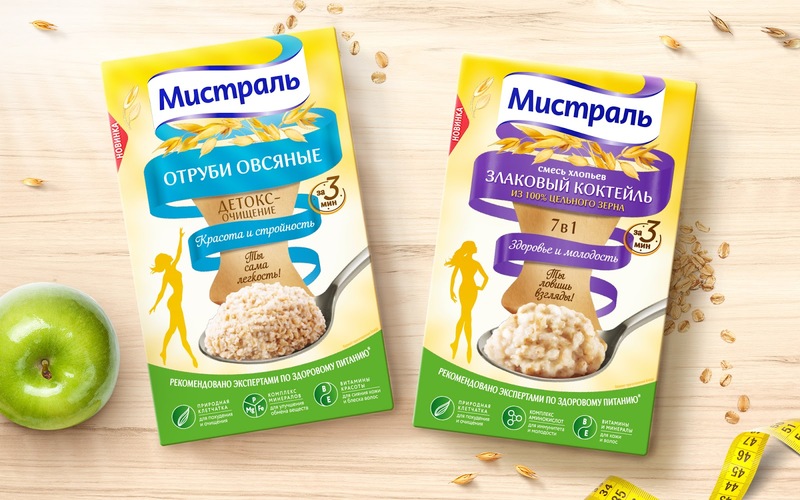 Supporting the global trend on healthy lifestyle, the company decided to release a line of fitness breakfasts, aimed at people who want to have a healthy breakfast with a minimum of calories. Our task was to make the design focus on lightness and airiness, to make the new brand attractive to those who watch their figure. It was necessary to stay within the entire range of breakfasts Mistral, but to allocate a new product. A gentle range of pastel colors, used for background, creates an atmosphere of lightness and sophistication. Aspiration to cherished harmony is emphasized by a thin waist, which is wrapped with the branded tape of Mistral. On the front side of the package are used motivating inscriptions: "You are lightness yourself! ", "You are catching views! ", "You are in great shape"! In addition, the line delineates the silhouette of the girl, which introduces an element of airiness and weightlessness into the design. Below we placed pictograms reflecting the main advantages of the product. All the necessary information on the content of vitamins and minerals is described through the infographics on the side of the package. Especially for this project, we made a collaboration with well-known bloggers. 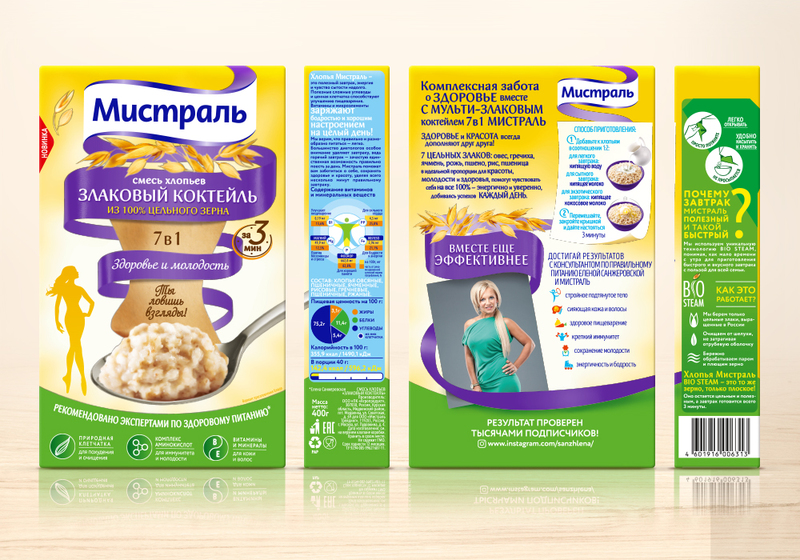 The fitness range is represented by three SKUs: oat flakes with bran, cereal cocktail and oat bran. A specific expert is responsible for each SKU. 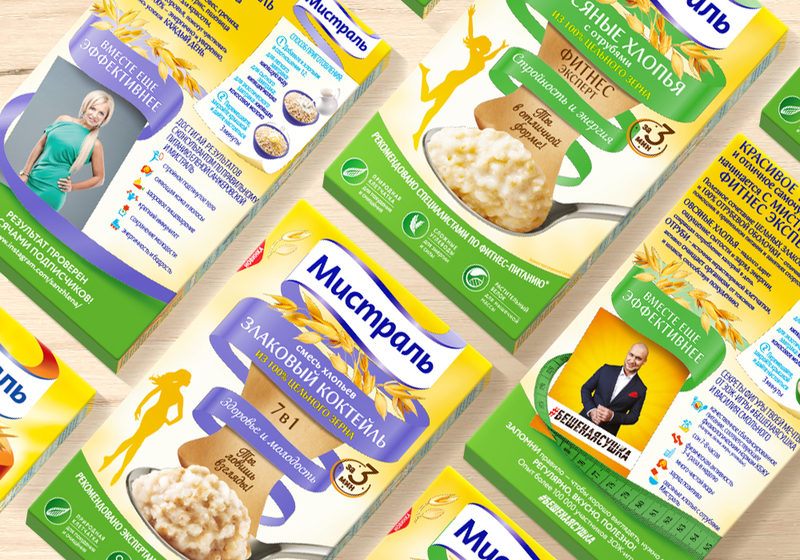 The author of the popular project "Mad Drying" Vasily Smolny is responsible for the "sports part" of the project, Olga Malysheva, detox expert, and Julia Smolnaya, nutrition counselor, disclose all the secrets of health and longevity. Watching a figure does not mean denying yourself tasty and healthy food. And fitness breakfasts from Mistral prove it. Try a perfectly balanced porridge from Mistral. You'll like it!